I am sure that it will come as no surprises to you guys that I am doing a review of the new Nars Radiant Finish Foundation. When this was first released a couple of months back I got so many comments from people saying that I should try it and that they wanted to hear a review on it. As much as I really wanted to buy this foundation and try it straight away for you guys, I had so many foundations sat on my shelf waiting for me to review, I just couldn’t bring myself to buy another one because I like to give foundations a really fair trial and try them out for at least a couple of weeks. Anyway, now that I have my hands on this foundation and I have been wearing and using it for around a month now, I thought that I would share with you some of my thoughts. The first thing that I want to talk about, which is always the first thing that I talk about and that is the packaging. 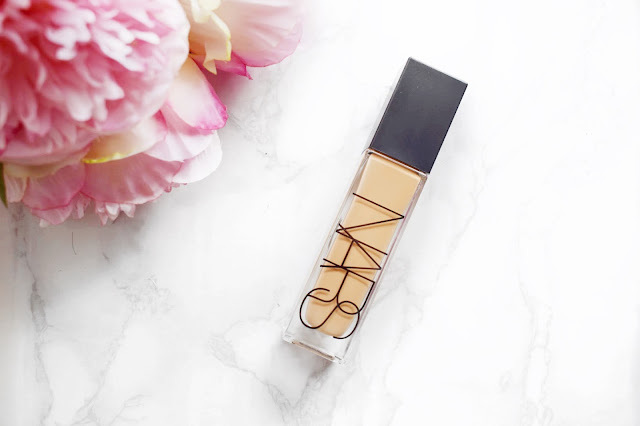 The bottle of this Nars Radiant Finish Foundation is just so beautiful and sleek. 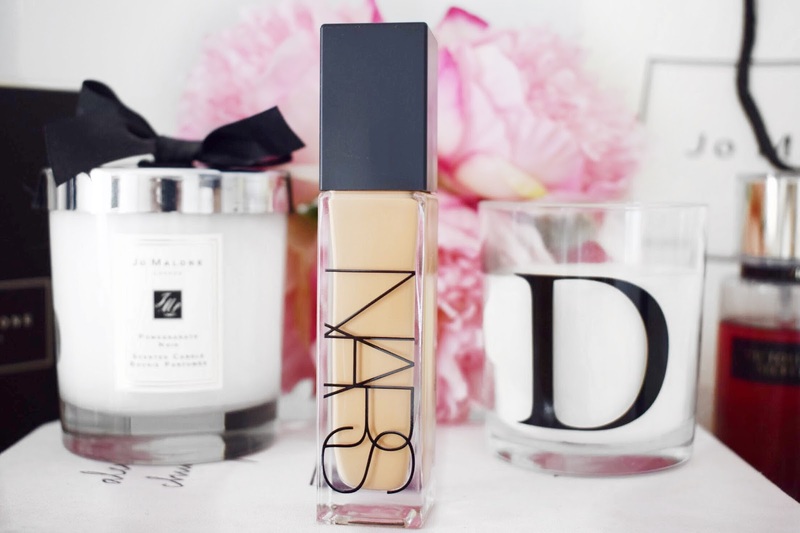 It is similar to other Nars foundation bottles in the face that it is a glass bottle with a lid on the top. I am very happy that it has a pump as standard because it annoys the hell having a to buy a new one of the Nars Sheer Glow Foundation. I think that the bottle looks really nice and I may even prefer the packaging to the Nars Weightless Foundation. Now, something else that I want to talk about that is very important is the shade range. I am always the shade Syracuse when it comes to Nars foundations. I would say that the shades do vary ever so slightly between the different foundations, but it isn’t noticeable on the skin. I think that Nars has such an incredible shade range and is fully inclusive, I can imagine that most people would be able to walk into a store and be able to find a foundation that is a good match for them. Consistency wise this is a very thin and lightweight foundation. When you pump this out onto the back of your hand it is very runny. As I apply this to the face it always goes on incredibly smoothly and blends out like absolute perfection. I have used this with a damp Beauty Blender to apply it with or my trusty Morphe M439 and it always looks so stunning on the skin. Plus, as a side note, every single product that I have paired with this foundation whether it be a concealer or a cream contour, it just blends in like a dream and looks so beautiful. I am still to find anything that doesn’t pair like a dream come true with this Nars Radiant Finish Foundation. Now onto one of the most important things in my opinion and that is the coverage. This is a full coverage foundation, and there are no two ways about it. This is very full coverage and easily hides all of my imperfections with one light layer. With respects to the coverage it really does remind me of the Nars All Day Weightless Foundation, which everybody should know by now that I completely love. I even swatched this over the tattoo on my wrist and it completely covered all of it, which is going to come in very handy. With the lightweight texture of this foundation I would never guess that it would be full coverage, but I am very glad that it is! When I think about this foundation in comparison to the Nars Sheer Glow and the Nars All Day Luminous Weightless foundation, I cannot really think of that much that sets them apart. In my opinion, all of the foundations give the skin a very stunning and luminous finish with an incredible finish and great longevity. I have worn this foundation to work and then out in an evening and it has lasted like perfection all day long and still looked just as good at the end of a 12-hour day as it did first thing in the morning. Longevity is something that is very important to me with how many long hours I work and this Nars Radiant Finish Foundation it really has passed the test! This foundation set me back around £30, which is about standard for a Nars foundation and a price that I am really happy for this lovely foundation. Even though I don’t see a huge difference between the other Nars foundations, I do think I am going to carry on using and even repurchasing this foundation because I cannot deny that it looks beautiful on the skin. I will leave a link to this foundation down below in case you want to check it out for yourself. Make sure to leave me a comment down below and let me know if you have tried this foundation or if it is on your list for you to try out! I am completely in love with it! I haven't stopped using this for months, it is so beautiful on the skin! I am completely in love with it, the quality is just amazing! Nars foundations are my absolute favourites - sheer glow has been my holy grail for years. I really want to give this a go - I was sold when you said that it looks beautiful on the skin! I am completely obsessed with this! I haven't had the best luck with Nars base products but I've heard such incredible things about this foundation that it has left me super curious! I need to get my hands on a sample! Oh really? I have always completely loved them! This looks like a really nice foundation! I've been torn with choosing a nice base from NARS (specially between their tinted moisturiser and their all day luminous weightless foundation) but this one also looks like a really nice option! I love Nars as a whole, I am just so happy that this lived up to my very high expectations! I haven't tried Nars foundations yet. I currently use Fenty. Really happy with it! I really want to get my hands on the Fenty foundation soon! wow that foundation looks amazing !! thanks for the great blog post ! It is one of the best foundations that I have ever used! I have heard quite a few people say that, but I completely adore it! It is an amazing foundation, completely beautiful! Aww thank you sweetie, your comments are always so lovely! The quality is just out of this world, I am completely obsessed!